Looking for a super cute Storks movie snack to celebrate the upcoming release of this insanely adorable family movie? 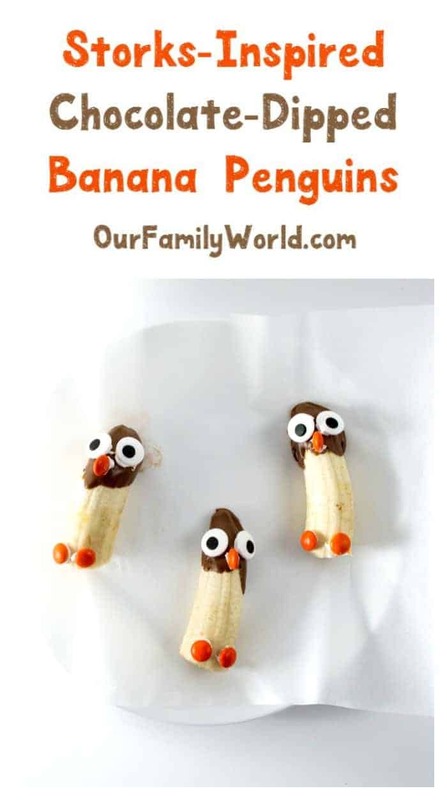 Our chocolate-dipped banana penguins are easy to make and fun to eat! 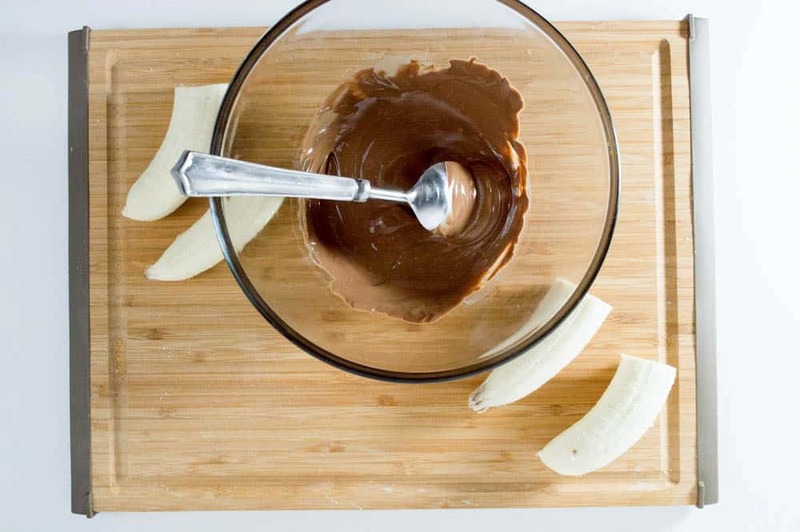 They’re also the perfect after school snack idea! I can’t wait to show you how to make these. I think they might just be my favorite movie recipe yet (and that’s saying a lot because I’m also pretty in love with our Finding Dory blueberry ice-cream!). 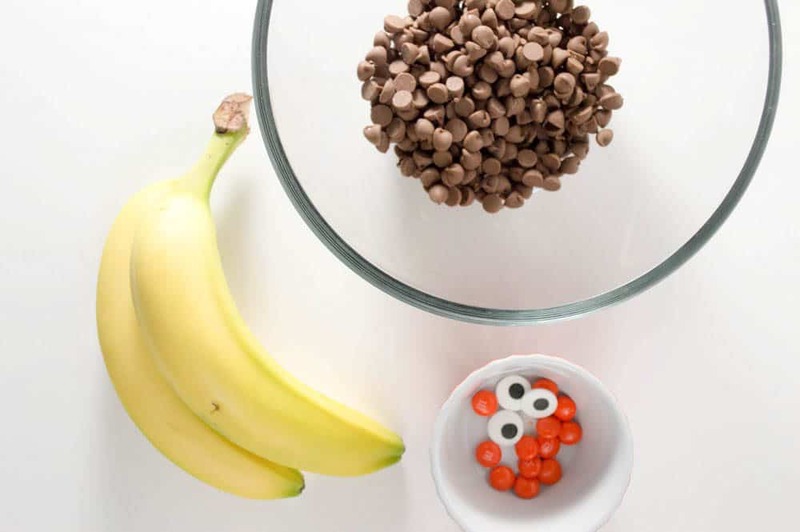 Making movie-themed snacks isn’t just a great way to gets kids excited about family film night, it’s also a creative way to bond in the kitchen. While you’re mixing and stirring, talk to your kids about their day, ask open-ended questions, share stories from your childhood and really just get to know each other better. Let’s check out this absolutely darling Storks movie recipe, shall we? Do you have any favorite movie treats? Are you looking forward to seeing the Storks movie with your family? Tell us in the comments! Melt your chocolate chips either in the microwave or over a double boiler. Once completed melted, add coconut oil and stir until well combined. Line a cookie sheet with parchment paper. Set both chocolate and pan aside. Peel bananas and cut each one in half. Dip the pointed end of the banana in the chocolate, covering about 1 inch. Place carefully on lined cookie sheet and let chill for about 20 to 30 min. in the refrigerator. This recipe was created by our very talented writer, Lisa, and as you can see, it came out spectacular. I want to share with you one of my favorite tips for melting chocolate, though. I don’t have a double boiler, and I don’t like to use the microwave to melt it because I can never quite get it right. I use a small or medium (depending on what I’m making) stainless steel saucepan . I’m talking the old-school saucepans, here. We’ve had ours since I was a kid. I find that the chocolate melts perfectly over low heat. I can leave it on the lowest heat and stir as needed while I work without it seizing up. Cleanup is actually a lot easier than you might think! Cute! They look very delicious! Never had this, they look cute though. This is so adorable! I love that it’s so easy to make. This is even perfect for Halloween. I’m sure it’s going to be a hit with the kids! As soon as I seen these I giggled !! Adorable. A great fun snack to make with the kids. These little treats are just ridiculously cute! Thank you for sharing with us at #FoodieFriDIY! Stopped by to do some sharing and also let you know I’m featuring your fun recipe this week! Come back and share again soon! Oh my gosh! Those are SO cute! I’ll have to make these with my boys. These look so cute and yummy. I will have to make these for my son and his friends. I am unfortunately allergic to bananas.